Rajon Rondo is one of the most unique players in the NBA, blending excellent court vision and creative passing with a knack for getting rebounds and clogging up passing lanes. What his game is lacking is the ability to shoot the ball consistently. His inconsistent shooting along with questions stemming from his torn ACL and his future in Boston keep Rondo from being a top-15 player in fantasy basketball. He still is a top-8 point guard and an excellent source of assists, steal and rebounds at the point guard position though, making him a solid third-round selection. Coming out of the University of Kentucky, Rondo was an athletic point guard who had a lot of raw ability. He was very talented, but had an inconsistent shooting stroke. He dropped to the 21st pick in the first round and was selected by the Boston Celtics. After his rookie season, he had assumed the starting point guard role. In the offseason, the Celtics made a big splash though acquiring Kevin Garnett and Ray Allen. Immediately, Rondo became the fourth option for the Celtics as they chased a championship. He was responsible for handling the ball, passing it well and not turning it over as the floor general. Rondo thrived in his second season, averaging about 10 points per game, five assists, four rebounds and two steals per game as the Celtics won the title. In 2009, Rondo became much more than a role player. He was thrust into the spotlight during the Eastern Conference Playoffs when injuries and age started to pile up for the Celtics. Rondo averaged nearly a triple-double during the playoffs and was quickly moving up the NBA point guard ranks. In 2010, Rondo led the league in steals and averaged over 11 assists per game, making him a very attractive fantasy option. In 2012, he was on his way to his best season as a professional and was a prolific fantasy option, averaging a double-double with points and assists (13.7 and 11.1) to go along with over five rebounds per game. That was until he tore his ACL after 38 games. Last season, Rondo, played in the second half of the year and while his points and assist numbers didn’t dwindle, he shot a career-worst 40 percent from the field. With a poor shooting percentage, lack of three pointers made and percentage at the free throw line less than 63 percent for his career, Rondo is outside of the top-five at his position. Stephen Curry, Chris Paul, Russell Westbrook, Kyrie Irving and John Wall all make over a three-pointer per game and shoot well from the charity stripe. If Rondo can improve his free throw shooting and prove that last season’s percentage from the floor was an outlier for his career, he will inch closer to top-five point guard status. Regardless, he’s one of the best options for assists in the league and if he is traded to a contender during the season, he will be an even better option. 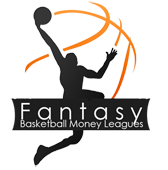 For more NBA news and updates, visit Fantasy Basketball Money Leagues today.